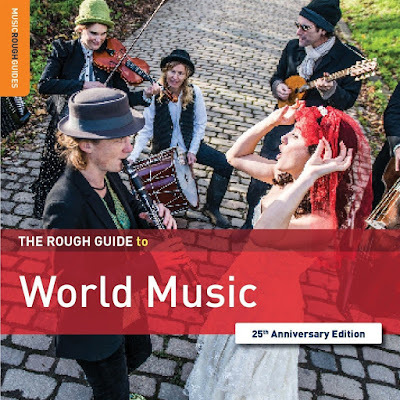 STEPHEN SPAZ SCHNEE: As you release the 25th Anniversary Edition of THE ROUGH GUIDE TO WORLD MUSIC, how are you feeling about the way things have evolved for World Music Network over the last quarter century? PHIL STANTON: So much has happened! Twenty-five years ago, we released our first compilation, the inaugural ROUGH GUIDE TO WORLD MUSIC. Some twenty-five years and 369 Rough Guides later, I went through the archives to put together this special anniversary edition. 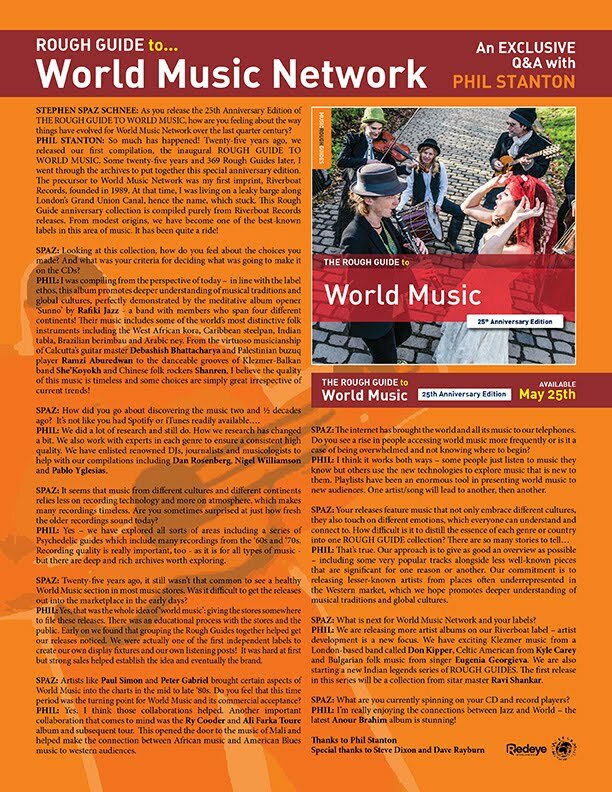 The precursor to World Music Network was my first imprint, Riverboat Records, founded in 1989. At that time, I was living on a leaky barge along London’s Grand Union Canal, hence the name, which stuck. This Rough Guide anniversary collection is compiled purely from Riverboat Records releases. From modest origins, we have become one of the best-known labels in this area of music. It has been quite a ride! SPAZ: Looking at this collection, how do you feel about the choices you made? And what was your criteria for deciding what was going to make it on the CDs? PHIL: I was compiling from the perspective of today – in line with the label ethos, this album promotes deeper understanding of musical traditions and global cultures, perfectly demonstrated by the meditative album opener ‘Sunno’ by Rafiki Jazz - a band with members who span four different continents! Their music includes some of the world’s most distinctive folk instruments including the West African kora, Caribbean steelpan, Indian tabla, Brazilian berimbau and Arabic ney. From the virtuoso musicianship of Calcutta’s guitar master Debashish Bhattacharya and Palestinian buzuq player Ramzi Aburedwan to the danceable grooves of Klezmer-Balkan band She'Koyokh and Chinese folk rockers Shanren, I believe the quality of this music is timeless and some choices are simply great irrespective of current trends! SPAZ: How did you go about discovering the music two and ½ decades ago? It’s not like you had Spotify or iTunes readily available…. PHIL: We did a lot of research and still do. How we research has changed a bit. We also work with experts in each genre to ensure a consistent high quality. We have enlisted renowned DJs, journalists and musicologists to help with our compilations including Dan Rosenberg, Nigel Williamson and Pablo Yglesias. SPAZ: It seems that music from different cultures and different continents relies less on recording technology and more on atmosphere, which makes many recordings timeless. Are you sometimes surprised at just how fresh the older recordings sound today? PHIL: Yes – we have explored all sorts of areas including a series of Psychedelic guides which include many recordings from the ‘60s and ‘70s. Recording quality is really important, too - as it is for all types of music - but there are deep and rich archives worth exploring. SPAZ: Twenty-five years ago, it still wasn’t that common to see a healthy World Music section in most music stores. Was it difficult to get the releases out into the marketplace in the early days? PHIL: Yes, that was the whole idea of 'world music': giving the stores somewhere to file these releases. There was an educational process with the stores and the public. Early on we found that grouping the Rough Guides together helped get our releases noticed. We were actually one of the first independent labels to create our own display fixtures and our own listening posts! It was hard at first but strong sales helped establish the idea and eventually the brand. SPAZ: Artists like Paul Simon and Peter Gabriel brought certain aspects of World Music into the charts in the mid to late ‘80s. Do you feel that this time period was the turning point for World Music and its commercial acceptance? PHIL: Yes. I think those collaborations helped. Another important collaboration that comes to mind was the Ry Cooder and Ali Farka Toure album and subsequent tour. This opened the door to the music of Mali and helped make the connection between African music and American Blues music to western audiences. SPAZ: The internet has brought the world and all its music to our telephones. Do you see a rise in people accessing world music more frequently or is it a case of being overwhelmed and not knowing where to begin? PHIL: I think it works both ways – some people just listen to music they know but others use the new technologies to explore music that is new to them. Playlists have been an enormous tool in presenting world music to new audiences. One artist/song will lead to another, then another. PHIL: That's true. Our approach is to give as good an overview as possible – including some very popular tracks alongside less well-known pieces that are significant for one reason or another. Our commitment is to releasing lesser-known artists from places often underrepresented in the Western market, which we hope promotes deeper understanding of musical traditions and global cultures. SPAZ: What is next for World Music Network and your labels? PHIL: We are releasing more artist albums on our Riverboat label – artist development is a new focus. We have exciting Klezmer music from a London-based band called Don Kipper, Celtic American from Kyle Carey and Bulgarian folk music from singer Eugenia Georgieva. We are also starting a new Indian legends series of ROUGH GUIDES. The first release in this series will be a collection from sitar master Ravi Shankar. PHIL: I'm really enjoying the connections between Jazz and World – the latest Anour Brahim album is stunning! Please visit the World Music Network website for more info on all of their releases.